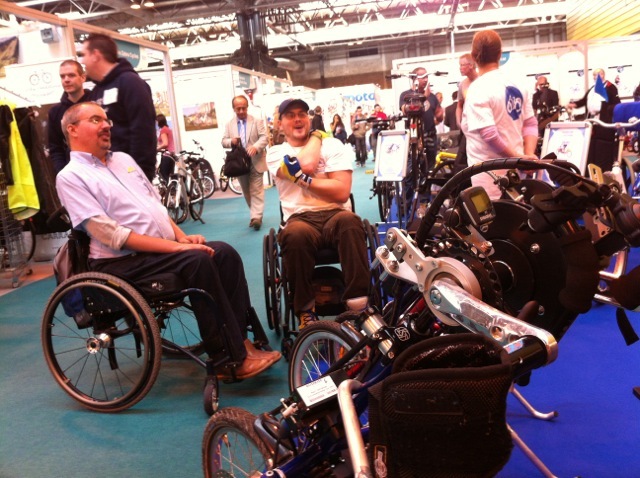 It was the second year for the Inclusive Cycling Hub – third if you count the genesis of ‘Inclusive Cycling’ as a theme at Earls Court – and the handcycle challenge was as popular as ever with the punters. The MS Society’s Simon Lord brought his electric bike to talk about. His piece in this edition of MS Matters (pg15) describes how going electric has enabled him to get back on a bike and the benefits that has brought both physically and mentally. Two thirds of the responses he’s had to the article are from people whose condition has progressed to a point where balance has become an issue and so need a power assisted trike. As it happened the hub was in the same hall as the electric bikes. 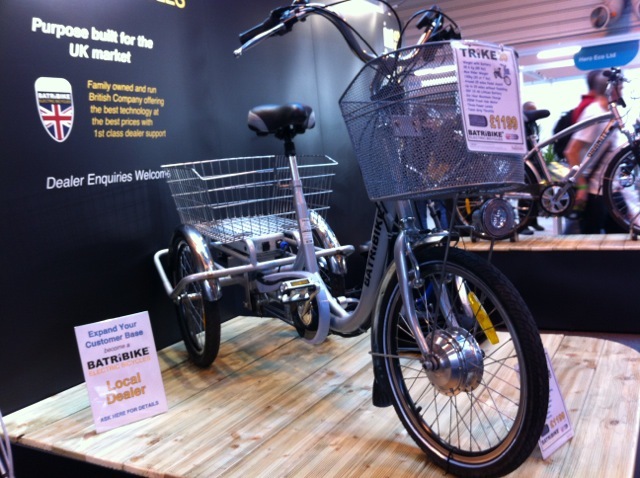 The only trike amongst them was from Batribike, the innovative Trike 20. The striking thing about it, apart from the impressive luggage carrying capacity, is the narrowness of the rear end – including the protective wrap around bars it’s no wider than a wheelchair at 65cm making it much easier to manoeuvre through doorways. Normally that would mean very poor stability when turning, but the rear wheels are kept on the ground by a pivot between the rear end and the main frame so the rider can lean into bends much like riding a two wheeler. The pivot locks out for mounting and dismounting. At the other end of the scale Campagnolo’s electronic gear mechs and shifters seemed to be the main news amongst the cyclesport stands. Peter Eland of Velovision and Electric Bike Magazine was across the hall from us. It felt to me that ‘electric’ was the strongest theme at the show – apart from the hub of course – and Peter’s faith in starting a new mag for it has been justified. CTC were a few stands along from us, crucially next to the better quality coffee stall. 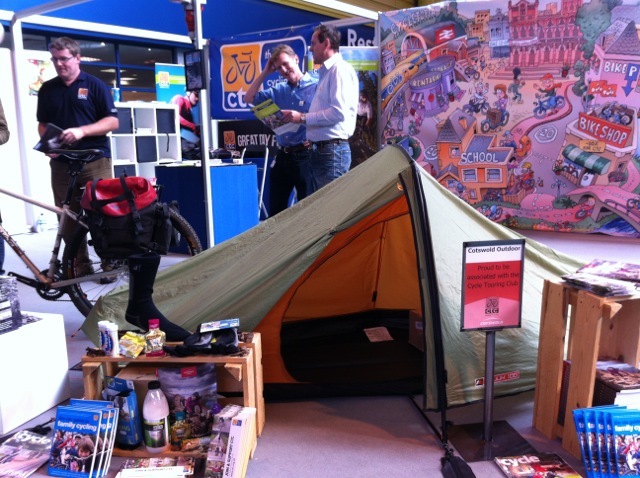 In the foreground is a touring setup with a Vaude one man tent and a ’29er’ that Chris Juden recently reviewed. The backdrop is Cycletopia, a world where using a bike is as normal as it is for the Dutch and the Danes, ie, inclusive. There was much cross-pollination, including Sheffield’s Steve Marsden popping round to get his first look at the Boma and have a chat with its inventor, Chris Swift. Will Hillsborough be getting one we wonder? Our own Martin came along with his Boma on the trade day and managed to get snapped with Sir Chris Hoy and pick up an ICF t-shirt at a bargain price. 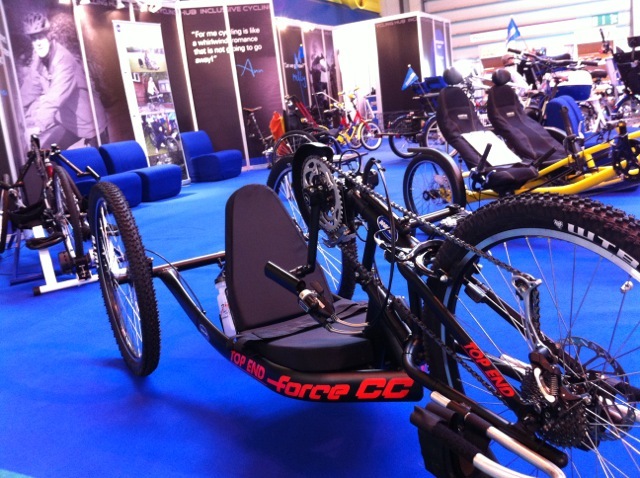 As well as the Boma, Molten Rock were showcasing some of their Stricker handcycle clip-ons. Very versatile, they adapt to pretty much any wheelchair via an ingenious clamping mechanism and can be fitted and removed without getting out of the chair. 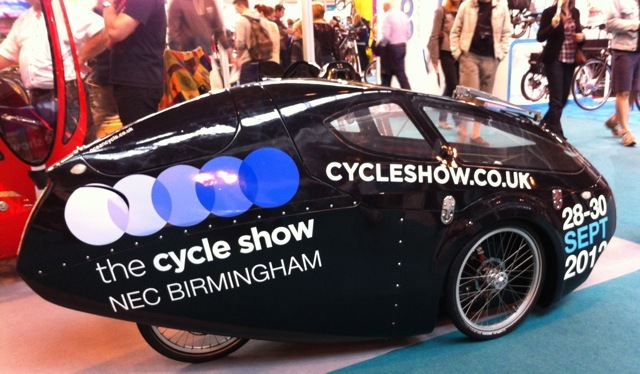 It’s an ideal way to get around something as large as the Cycle Show, as well as advertising Inclusive Cycling on the way, and along with this Stricker trailer it can be sociable too. And as demonstrated in that video clip, electric assist can be an ideal solution. Isabelle from Wheels for Wellbeing was using her handcycle to get around the show, but this wasn’t limited to the exhibitors in the hub, visitors to the show where also arriving at the stand in handcycles. Kath Cuthbert of Cycling Otherwise stopped by, her site includes a list of handcycling routes that she’s found to be accessible for a handcyclist plus partner. You’ll find a guest blog there from Simon Lord too – Kath also has MS.
We had a visit from Tim Morgan with his Mountain Trike. 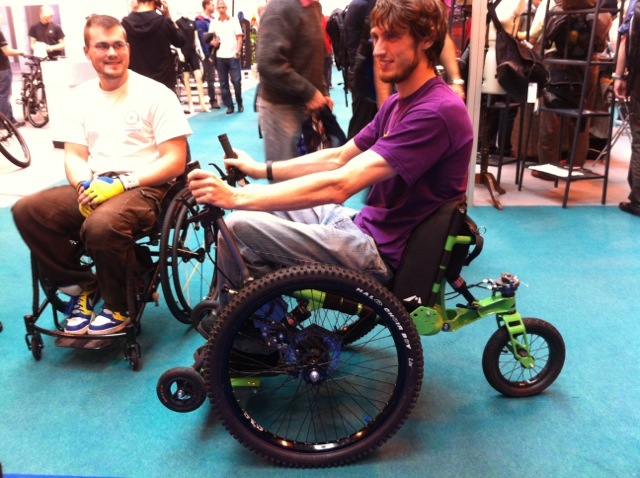 Incidentally, Rick Rodgers pictured on the left was Tim’s very first customer for the trike. It’s the first time I’ve seen one, heard a lot about it from Rick of course, and it looks very well executed. It makes the most of the mechanical advantage of the distance between the shoulders and the driving wheels – pushing forward on the levers turns the wheels. There’s a disc brake on either side and you can steer the rear wheel from one of the levers. No more mucky hands! You can hire one to give it a good tryout. And to finish, remember the Berkel Bike that appeared in Velovision a few years back? The hand and foot cranked bike? Paul Moore of Active Linx spent a day at the hub and he’s the UK dealer for them. Perhaps I’ll get along to the London show next year. Hopefully I’ll find plenty of interest.